Any suspicious physical event/trauma leading up to dizziness : Nope, tried to get out of bed and couldn’t. Start of chronic phase : seems as if it were chronic from the beginning but in retrospect it was acute / debilitating vertigo for a month, then leveled off to a constant nightmare thereafter. GP: day of onset and about once per month thereafter seeking help. ENT: 2 1/2 months after onset and about 5 times thereafter seeking help. ophthalmologist once. Physical (vestibular) Therapist 3 months, twice a week. otolaryngologist: finally a real diagnosis! Screaming tinnitus… absolute screaming. Now gone. All of the above are now diminished with Amitriptyline. Medication I’m taking for other conditions :None. Any personal history of migraines : Have had “bad headaches” for years. Any family history of migraines : Father, grandmother and grandfather. Any history of ear problems : Oh yes! I grew up with cotton balls in my ears. So much ear trouble as a child. How did friends, family, and doctors react to your symptoms? They were supportive but couldn’t possibly comprehend why I was not getting better when everyone with BPPV “does the epely and gets better”. Had very difficult times with my husband who was frustrated by not being able to help. My mother thought I had PTSD from an horrible explosion at my work that killed 4 people 7 months prior. Drs (until my most recent) always seemed just baffled…not that they didn’t want to help, just didn’t know how I suppose. Hi everyone! Thought I would update my diary with my 3 month follow up with Dr Goebel today. I have now been on Ami for 11 weeks at the 50mg dosage. He seems happy with the progress I have made so far and I am happy too. All of my symptoms have lessened in severity with the exception of the tinnitus which has completely disappeared! On average, I would say my days are in the range of 70-80% of what was “normal” before VM struck. My “bad days” are somewhere in the 60% “normal” range. I’d say that’s pretty good comparatively! Bad days are very balance challenged and usually involve a whopper of a headache. Dr G will see me again in September to re-evaluate my progress but for now, I keep doing what I am doing. I am very pleased with today and happy to have such a wonderful Dr who actually “gets it”. I spent so many months in agony with Drs who looked at me like I was crazy… not Dr G, he can finish my sentences when I describe something only us MAVers usually understand. What an inspirational story. So much strength and perseverance. You’ve been through a hell of a year, but how wonderful to read you’re starting to feel better. Wish you a good further journey of recovery. 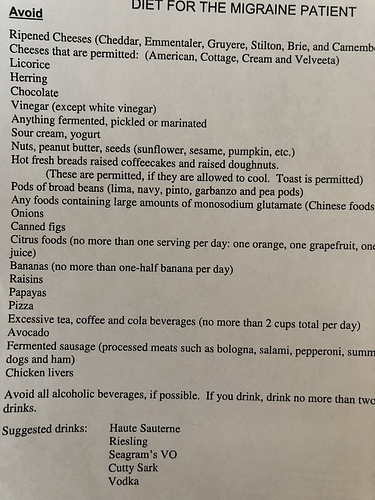 Can I confirm you are on migraine diet, and caffeine restriction? 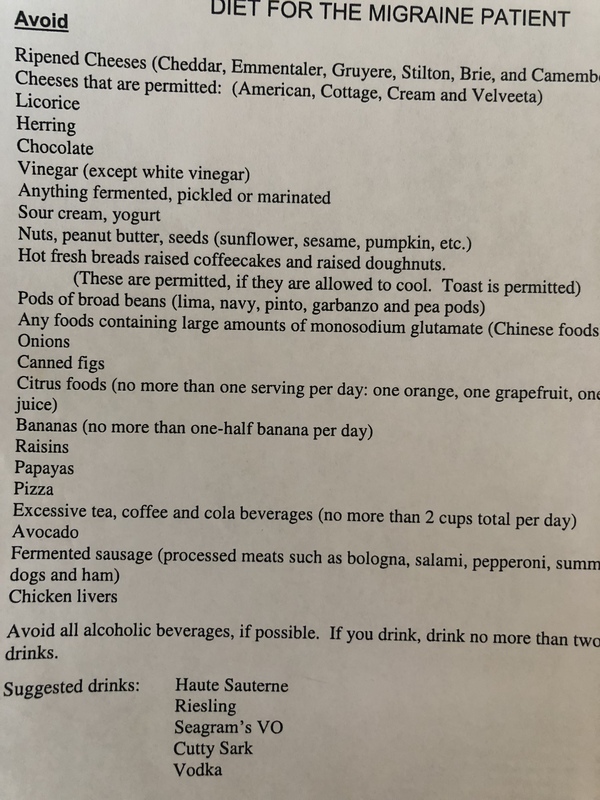 Hi Helen, my diet has changed considerably as I am simply using the chart my Dr gave me which is not nearly as inclusive I’m sure as the Johns Hopkins or others that help MAV. I have eliminated caffeine and not an easy task to rewire my brain which has been on a high caffeine diet for decades! I think caffeine and MSG are big ones for me. Funny that I’ve tolorated Ami so well considering I have always been a lightweight when medications or even alcohol are involved. Luckily, I don’t like alcohol so elimating that one was no issue. Ami has treated me well… don’t get me wrong, there were days that I had side affects, but none any worse than my typical horrible day. I do also think the B2 and Magnesium Citrate have helped tremendously. Thank you so much Lucy! Hardest thing I’ve ever gone through no doubt and so many days, weeks, months I didn’t know how I would survive. I literally cried every single day for months… that’s not me! The emotional side of healing may be the single most important to recovery for me. @Onandon03 , here is the handout from my Dr which is what I follow. I’m sure nothing much different than others that have been uploaded. Miss cheese, peanut butter, pickles and olives the most! Yep, I echo the wondering how to survive, the crying. For me it’s pretty much survival mode every day but determined to get through this if only for my little boy’s sake. So pleased for your Renee. Have read your descriptions of how unwell and how desperate you felt when it was bad (this is how I still feel most of the time!) so it’s so good to read you’re starting to feel better. Hi Helen, he does hope the Ami will continue to conquer some of the lingering issues… he does makes it clear that not all of them will go completely away, thus the “migraine brain” comment. He said “being a migraineur”, I will always be sensitive to various things. He said I probably won’t want to see a 3D movie with virtual reality goggles anytime soon and I wholeheartedly agree with that comment! Lucy, I am so blessed to have the support of you and so many here! Thank you! Don’t ever stop searching for your cure… I firmly believe there is one for each of us, we just have to find it. While I am not cured, I have come so far that I can live this way and am grateful to be a well as I am. Thank you Lucy! Me neither. That’s one thing I’ll most probably avoid for ever. It would be my idea of torture. I doubt I’ll ever go sailing in a Force Seven Gale ever again either but then Life should be about what you,can do, not what you can’t! Blimey and has giving up all that helped?! The problem I have with migraine diets is that it’s fairly clear MAV <> regular migraine. I think the 6C’s is worth trying for relief rather than banning all this? Especially when you are on medication in any case? Hi Helen! Maybe too early for him to commit to a cure, he might just be hedging so he and I will be pleasantly surprised if / when a cure comes I have faith that I will be cured one day, I’ve climbed this far… I can keep on climbing! Wow, the discipline!!! I’m impressed! (but yeah, cut sugar and it should lower tinnitus too). Thanks James! Sugar is my biggest weakness and the Ami ramped that up about 10 notches!